Wagging tails and slobbery faces were abundant at the 24th Annual Walk With the Animals where fur and feathers flew about Fairmount Park in Riverside, California, to raise money for the Mary S. Roberts Pet Adoption Center, a no-kill shelter that serves the Riverside area. The March 19 walk included a pancake b r e a k f a s t , a 1.3 mile trot around Lake Evans and several K-9 demons t r a t i o n s . With multiple sponsors and a bevy of vendors, participants had access to everything from glittery harnesses and animal-inspired jewelry, to the ability to adopt dogs and cats onsite. After all was tallied up, the event raised more than $53,000 to benefit the center and the orphaned animals within it. Many individual fundraisers brought in more than $500 each, with up to almost $3,000 being raised from just one registered person. The top teams were Paws for a Cause that raised $1,175, Mutts and Wiggles Butts raised $835 and Sunny with a Chance of Pibbles brought in $580. 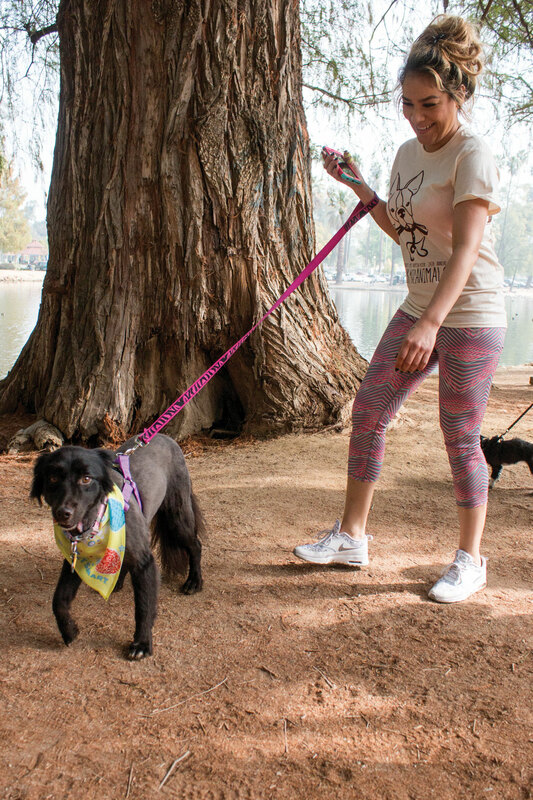 Each participant received a commemorative shirt and dogs that had been adopted through the shelter wore an alumni strap over their leash, leaving dots of orange traveling around the park indicating the success the center has at rescuing and adopting out pets. A dog was not required for participation as a white miniature horse made its way into the crowd of canines and an Ocicat cat sat comfortably in a stroller while her owner pushed her around to visit stands. Farm groups brought their chickens and goats and KOLA, classic hits radio station, set up a booth to hand out prizes. Several California Baptist University alumni were spotted busily running around as volunteers donning highlighter t-shirts and local photographer Chase Leland, of Chase Photography, showed up to volunteer his time in photographing and promoting the event. Demonstrations were performed to show people how to give their pets proper exercise and they ended with officers from the Riverside Police Department displaying the incredible power and training their police dogs had. From Chihuahuas in tutus to Italian Greyhounds in bunny-eared headbands, the Walk With the Animals promoted respect and love for pets of all kinds and encouraged people to adopt a cat or dog from their nearest shelter, providing a forever home to a furry friend and receiving endless love in return.